Flash sales cause people to do crazy things—camp out overnight outside stores, scavenge last-minute coupons, and plan their shopping trips like top-secret Navy SEAL operations. For consumers, this is a small price to pay with such deep discounts as a reward. For you, the payoff can be even greater. Successful flash sales can generate a 35% lift in transaction rates, not to mention bring in a horde of new customers to your business. But profits aren’t guaranteed. You have to execute flash sales correctly to reap the benefits. And that’s exactly what we are going to teach you how to do today. This is a 2-part article series on how to run successful flash sales. In Part 1 below, we will dive into what flash sales are, how you can benefit from them, and how to prepare for them the right way so you don’t make costly mistakes that could damage your brand reputation. In Part 2, we will cover how to execute and market a flash sale from start to finish. What Is a Flash Sale? Will It Help or Hurt My Business? When you run a flash sale, you offer product discounts (often deep ones) for a limited amount of time, typically 24 hours or less. Here’s an example of a flash sale offered by Neiman Marcus Last Call. The brand discounted its products 75% for one day only. J. 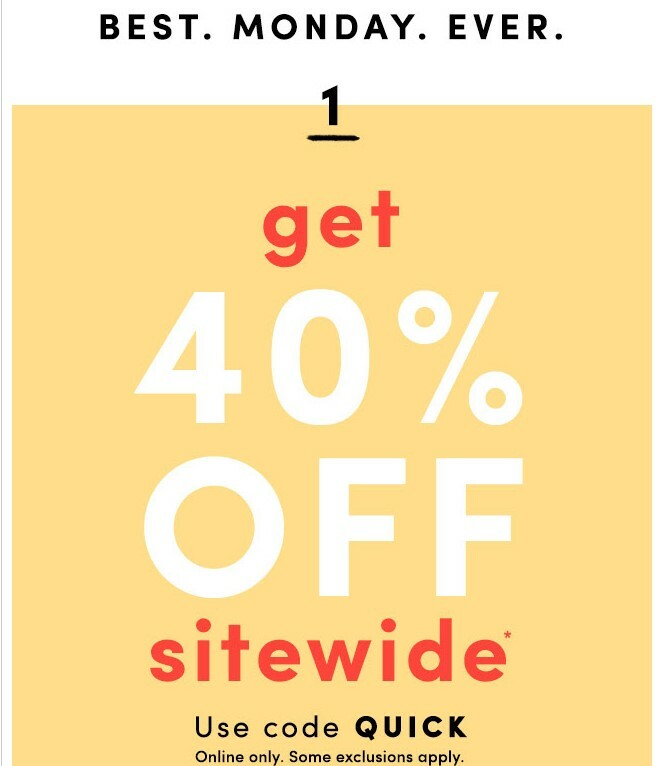 Crew Factory is offering a special 40% off sale for one day only (Monday). Today’s consumers are faced with numerous sales from hundreds of companies on a daily basis. Flash sales give you a way to stand out from the crowd and offer a limited-time offer that urges consumers to click and buy (quickly). They cater to the impulse shopper, the consumers who can’t bear to miss out on a discount, fearing it will never come around again. This is why successful flash sales can be so lucrative for brands. According to Reuters, businesses that used holiday flash sales grew at least twice as fast as other e-commerce stores during one holiday season. But, here’s the thing…flash sales aren’t right for everyone. Flash sales (with deeper discounts) can cut into your profits, so your goal isn’t to make hefty initial gains. If you are looking for a large burst of revenue in a short period of time, flash sales may not be the way to go. The true power of flash sales is the trust you gain from new and current customers and the future revenue it could turn into. Brand awareness – Flash sales catch the attention of new consumers who may have never heard of your brand or products. New customers – Some of those people who are now exposed to your brand may also become customers. While a lot of flash sale buyers are in it just for the deep discounts, a percentage can stay connected to your brand (if they love your products) and become repeat loyal customers. This also hinges on how well you planned and prepared for the flash sale (we will discuss this later in the article). Current customers – Want to reactivate current customers? Maybe you have some customers who haven’t engaged with your brand in a while due to consumer overload. A flash sale can be just what they need to get reengaged. Aside from business building, flash sales can also help you get rid of excess inventory (end of season, old items, etc.) so you can make room for new, top-selling items. 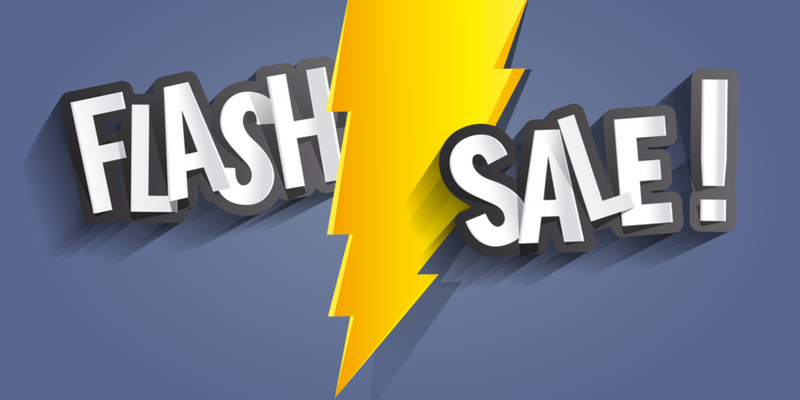 Is a Flash Sale Right for YOUR Business? To successfully answer this question, determine WHY you want to run the flash sale. What is your overall goal? If any of these line up with your own goals, then flash sales could work well for you. Having said that, think about your long-term plan for these sales. 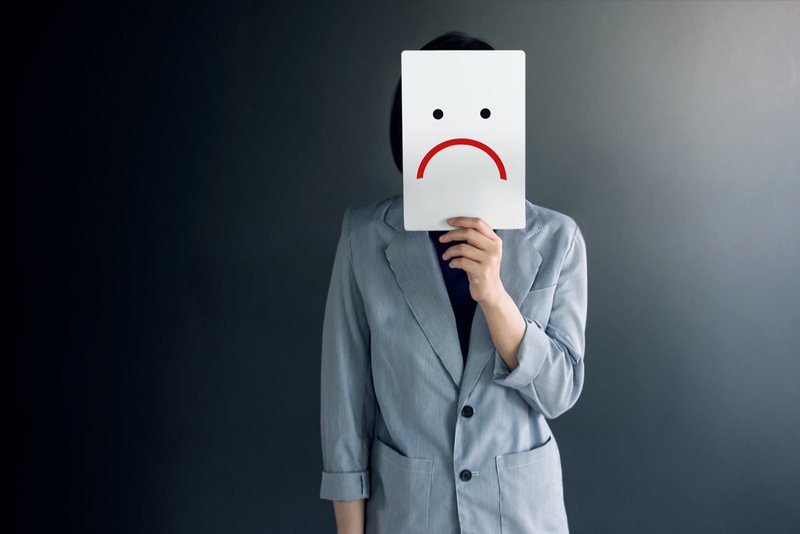 Since huge revenue gains may not be your main goal when deep discounts are involved, these sales could hurt you if they don’t result in any new customers OR they turn customers away due to unpreparedness. In addition, because so many brands are running flash sales now, your customers may not even notice your sale in the sea of others. So the key here is to plan the right way to ensure a successful sale. Below we will go through the important steps to planning a successful flash sale. In Part 2 of this article series, we will go into how to execute one from start to finish and market it for maximum results. Before you start your flash sale, get super clear on your campaign goal. This is your WHY. Sure, it would be great to increase website traffic, get new customers, and retarget current ones all at the same time (and that may happen), but, this is too many goals. Focus on one specific goal so all of your targeting, marketing, and preparation aligns. Once you determine your goal, choose WHAT product(s) to sell and WHOM to target. First, decide if you want to target new or existing customers. Do you want to build your customer base or reengage existing customers? Well, you may actually accomplish both anyways, but you still have to target one because your strategy and/or your product choice will differ depending on your answer. Once you decide on your target, choose your product. Let’s dive into this a little deeper and talk about which products to choose depending on whom you are targeting. It may not be a good idea to sell excess inventory if you are trying to target new “Old” inventory may appeal more to the people who are already familiar with your brand. Consider moving out current inventory only to make room for next season. Go with what you know. Promote your top-selling item in the flash sale, the one you know most of your customers love. Don’t test out new products when targeting new customers. Steal customers from your competitors by offering similar products at a deeper discount. This may cut into your profits, but you may also gain another customer. Choose a product based on how you can personalize the marketing. We talked about personalization marketing in a recent article and how it increases conversions because of its relevance to the target. Whatever product you sell during the sale, create segments for your newsletter to target only the people who would be interested. 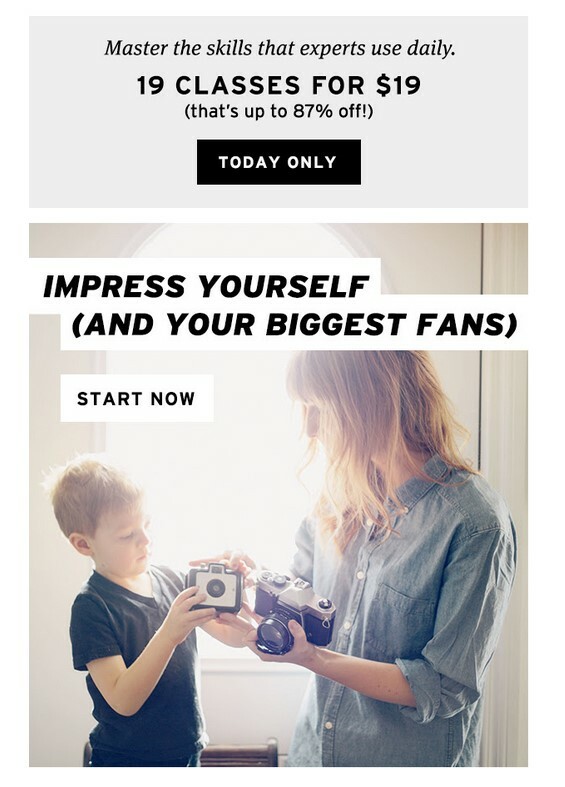 Creative Live is likely sending out this flash sale email below because I am a customer who already bought a photography course. The email mentions other creative and photography courses I may be interested in. 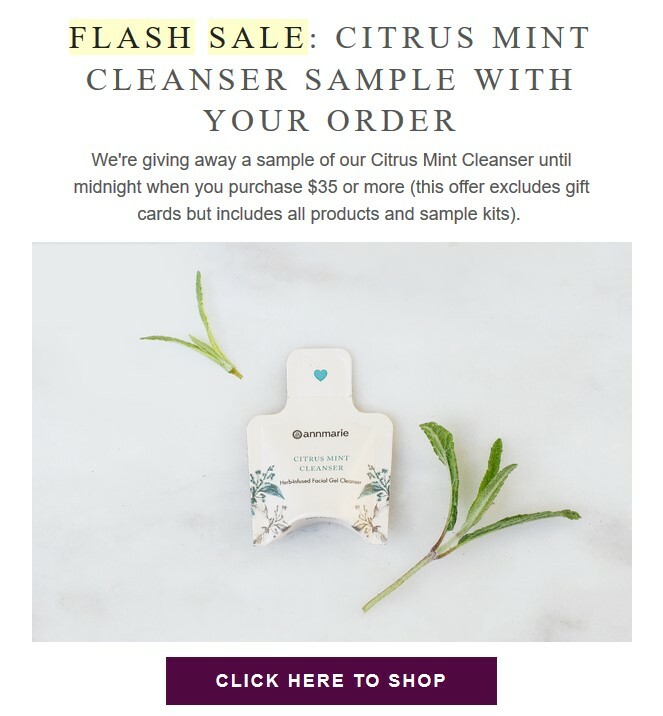 Instead of just launching a random sale, focus on product interest and send out the email to a segment that would be interested (previous customers who bought similar products). We will talk about flash sale marketing in more detail in article two of this series. Similar to new customer targeting, current customers will also be interested in your best sellers. Tip: If you are running a short promotion (less than 12 hours) and/or you don’t sell a lot of products, consider using a best seller, a product proven to perform well. Excess inventory: Trying to get rid of excess inventory? Sell to existing customers who are already familiar with your brand. The holiday season is approaching, so running a few holiday flash sales (including Black Friday) will be expected and could result in some nice gains. Here’s a cool tactic to prepare for holiday flash sales: Run a flash sale targeting new customers early in the holiday season (October). This way, you will increase your customer base in time for the holiday rush. Every holiday is a prime opportunity to run 24-hour flash sales. You’ve seen the holiday email promos, right? Father’s/Mother’s Day, Labor Day, Memorial Day, July 4th, and of course the Christmas season are great opportunities to boost sales and customers. How long should I run my flash sale? Typical flash sales run for 24 hours or less. Some run for a couple of days to a week, and others run for a couple of hours. It all depends on what your audience prefers. According to a study, 3-hour flash sales have 14% transaction rates (the highest tested). In addition, sending flash sale emails after 3 p.m. into the evening results in a 9% higher open rate and 23% higher transaction rates than sending them around lunchtime (midday). Here’s the thing though…the risk with running 3-hour flash sales is that you may not have enough time to capture attention. What if your customer is in a 3-hour meeting? At the spa? Making dinner? Three hours doesn’t leave a lot of room for engagement. Typically, flash sales run for 24 hours at least. But, if you want to try it, test out a 3-hour sale and see how it does. Alaska Airlines sent out this sale below with only a few hours of warning. I received this email at 10:28 p.m., and it advertised that the sale ended at midnight that night. Was this a 3-hour flash sale? I’m not sure. It could have been that the email provider was delayed in sending the email. 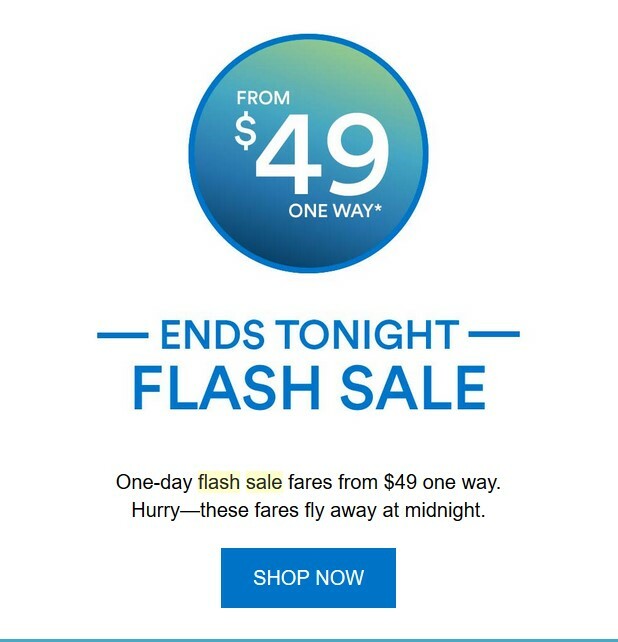 Alaska Airlines also sends out similar emails during other flash sales (it runs them about once a month), and they arrive at different times. 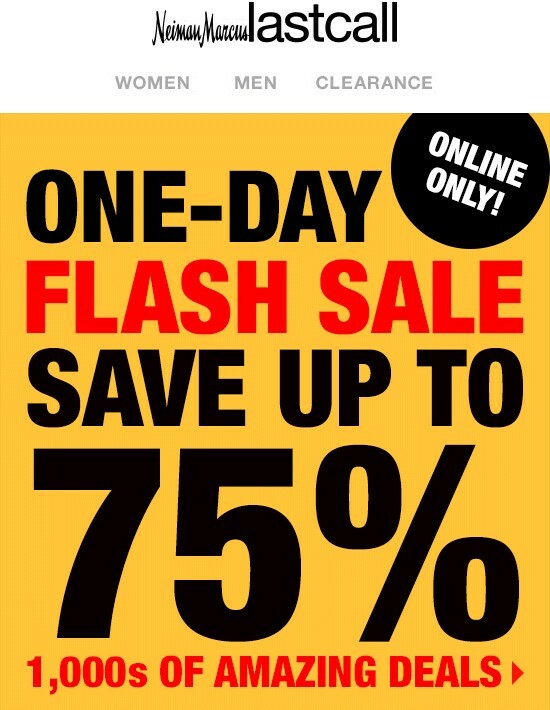 The company could also be testing flash sale time durations or the brand knows that different durations perform better on different days since I get the emails anywhere from 11 a.m. to 10 p.m. the day of the sale. The point here is that whether you are launching your first flash sale or you are a veteran, be strategic with the days and time duration and keep track of your results, letting the data inform your future decisions. So now you know what some other companies do…this is all fine and good but what does your audience prefer? It could be starkly different than what global statistics and other companies tell you. Here’s what I mean: Your data will tell you when to run your flash sale. Check your analytics data to see which days of the week (and what times) your sales are the highest. Check your email data to determine what send times your email open rates are the highest. If you don’t know, run some tests and send emails at different times to prepare for the flash sale. Split test the same email sent at different times to see which one performed the best. Run a couple of mini flash sales early in the season like we already mentioned and use two different sale durations. Notice which one performed better.I don’t suggest running multiple flash sales, one after the other, day after day. You don’t want your customers to think that your sales aren’t real because your prices are always that low. Also, the customers who paid higher prices may get angry if you keep slashing your prices so often. Having said that, since the holiday season is approaching, consumers are prepared for massive sales so it won’t seem out of the ordinary when you send a few their way. If this is your first flash sale, start with 24 hours and send emails after 3 p.m. and record your results. Take notice of email open rates/times, sales, and clicks. Use this data to inform your next flash sale. How Much Should I Discount My Products? It’s unlikely you will see a super successful flash sale that offers a measly 10% discount. Flash sales go for the deep discounts: 40%, 50%, 60%, or more. Why is it that you won’t see the crazy discounts retailers offer on Black Friday during non-holiday times of the year? Well, if they did, Black Friday wouldn’t be so popular with consumers. There would be no reason to fight the crowds on that one day if they can get the same discount any other time of the year. Offer a discount you wouldn’t normally offer so consumers know they need to take advantage of it right away—or else they will miss out. Another option is to advertise a much LOWER product price. 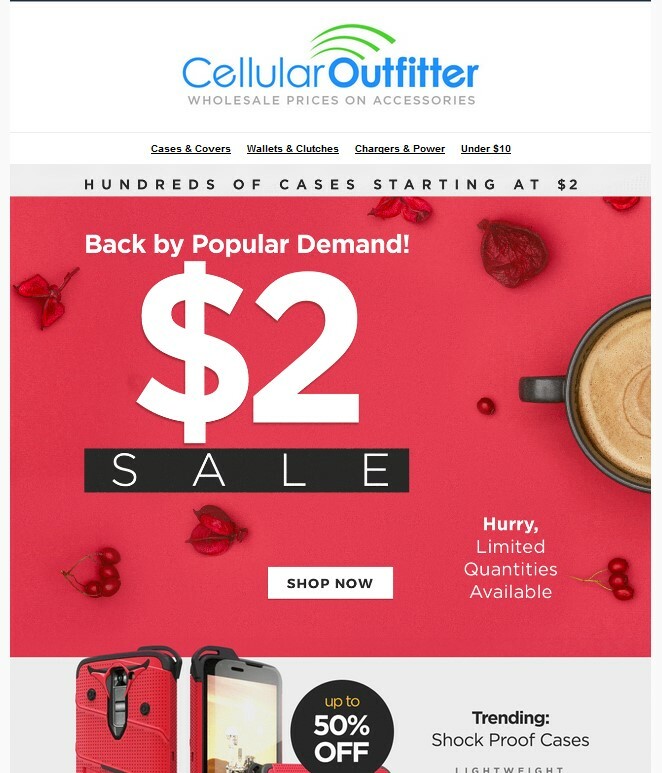 Cellular Outfitter just promoted a weekend flash sale discounting products to $2. Remember that the goal behind flash sales isn’t just to get some quick revenue. You may not even make as much as you would like. The ultimate goal is whatever you choose (brand awareness, traffic, attract new customers, reengage current customers), and the gains will be realized long after the flash sale is over. A flash sale can be hugely rewarding—or hugely damaging. This is why preparation is key, especially when it comes to shipping and inventory. Do you have enough inventory to satisfy volume? If you have run flash sales before, you will have a better idea of the demand. If not, get some figures from an experienced marketer on the typical percentage increases for your industry. This way, you can be prepared with inventory. Selling out during a flash sale is a no-no. How long will it take your customers to receive their products? If you are importing internationally and your shipping times range from 2-4 weeks, running a flash sale may not be such a good idea, especially if you are targeting new If so, be super clear on your product and checkout pages and how long it will take the product to arrive. People expect quick shipping; anything less and they may fault the brand. Additional traffic = website crash. Talk to your hosting company and make sure your site can handle the additional traffic surge. In Part 2 we will cover how to set up the actual flash sale and market it for maximum results. As always, if you have any questions or need assistance setting up or marketing your flash sales, let us know and we’d be happy to help.